This is the first of (hopefully) many guest articles. The author has wished to remain anonymous. I’m always accepting new submissions, so shoot me an email with a draft or your idea! Travis@TeamBadDecision.com. Given the ability to go back in time and deliver this article to my 20-year-old self, I cannot imagine the things I would have accomplished as an archery elk hunter over the next 13 seasons. In the end there is something to be said about paying the price for knowledge, and maybe my advice will help cut down the learning curve for you or motivate you to be better. Even if archery elk hunting is not your primary focus, most of this advice could be applied to any hunter looking to get better. After bowhunting elk for nearly twenty years, I have been fortunate enough to kill more than an elk per year on average, despite being an embarrassing hunter for many years. Let’s just say the last decade is where the success started to happen and killing two elk per year became the norm. Just before my 20th birthday, I got serious about chasing elk in the backcountry. My first-year backpacking into the wilderness of Montana with my dad forever changed my course as a hunter and a man. At the time, I felt like I had it all figured out, but in reality, I was an overconfident idiot with no reason to be cocky. The few elk I had killed up to that point meant nothing, my road ahead was where my true learning began. Tip #1: Toughen up kid! You are mentally weak, and it is costing you more than all your other shortcomings combined. You say you want to be successful, but your actions lead me to believe otherwise. Mental toughness is the single greatest trait a hunter seeking constant success can possess. This trait far outweighs skill in my book and leads into a topic best suited for thousands of words. Let me give you the gist: If you want to fill your tags every year, the sacrifice you will make is great. Some hunters do not have this goal and do not hunt for this reason. That is totally okay! My primary goal on every hunt is, and always has been, to be successful; that means notching my tag. If that is your goal, you will need to commit more time to hunting (likely 7-10 days per tag). You will need to learn how to be comfortable living many miles from your truck, and living on what you can carry. You will need to wake up long before light each day, and arrive back long after dark. Get to know your headlamp and lose any fear you have of the timber in the dark. In short order you will begin to love the woods and mountains at night, they will inevitably give you peace. Learn to commit to your entire hunt window and never quit early. This can be hard to understand for some, but many will understand right away. In the early years, my mind would start to break down after a few days of abuse, bad weather, blown opportunities, missed shots, being away from home, etc. With a planned 10 days to hunt, my hunting partner and I would pull out after 5-6. There was always an excuse, but it all came down to us being mentally weak. My 2016 bull may be the best example I can give about having mental toughness. During that season, my partner and I hunted our asses off for 10 days. We covered 15-20 miles each day and averaged 3-4k feet of elevation gain. We were at least a mile from camp in the dark every morning and chasing elk until last light each evening. We had blown countless opportunities, set a record for missed/defected shots, and had pretty much lost all confidence by day 8, but we kept hunting. After the 10th day, we fit in a last-minute, morning hunt, but we absolutely needed to be on the road by noon in order to make it to work the next morning. I clearly remember the conversation in the tent on that final night. “What’s the point of going out in the morning? We have pushed all of these elk into private land and it’s been days since we had a good opportunity. We are just wasting our time,” my partner said. And that is exactly what we did. We split up (not our normal tactic) and hunted hard. Ten minutes before I had agreed to meet back up with my partner and hike the 2.5 miles back to camp, I laughed to myself about the large group of bulls bugling a mile away on private. My calling setup thirty minutes earlier had gotten them fired up, but they kept moving further away. As I stood up to say my goodbyes to the elk and my favorite mountain range, a bull sounded off about ¼ mile away. Thirty seconds later he responded, closer. A few minutes later, I had arrowed a mature 5x5. This truly was a last-minute bull. NEVER QUIT. You will never kill them in the tent or driving home. Write that down. Tip #2: Quit being a know-it-all and become a student of guys that kill elk every year. You don’t know squat. Quit acting like you do. When you aren’t filling every elk tag, you know you aren’t an expert. Even if that happens, that does not mean you can’t be better or kill bigger bulls. I should have been told this at a young age because I was way too sure of my abilities, or rather, the lack thereof. My mind was closed off to advice and this was a giant handicap. After the 2009 season where we scampered back with our tails between our legs from unsuccessfully chasing elk in the coveted Gila Wilderness, I came across some material that changed my entire outlook on elk hunting. Elknut, also known as Paul Medel, opened my eyes to calling and understanding elk ‘language.’ Every blown scenario or inability to call elk in the past was suddenly clearly explained, and I was the dumbass he used as an example of what not to do. Paul motivated me to become a decent caller and understand elk language. With the many years of elk encounters and the experience I already possessed, it was totally natural to pick up his advice. During the next 9 seasons I was able to kill 19 elk with my bow, and my hunting partner close to the same number. Archery elk hunting is not always about calling in elk, even if that is the most enjoyable way to do it. A hunter must be willing to adapt his/her tactics. Being unwilling to adapt means that you will inevitably leave tags unpunched. Dan Evans was the first hunter that convinced me to try ambushing elk when the situation called for it. In recent years, this has become the primary method for how we hunt elk in Montana as they have become more and more call-shy late in the rut, but have remained just as vocal. Many times in late September and early October when you find sequestered groups of elk in the midst of a rut-fest, any unfamiliar call can shut them down. If you find that your calling is shutting down the elk vocalizations versus escalating them, it may be time to consider ambushing vocal bulls. It is not as hard as it seems to either sneak into a bugle, or head off a bugling bull as he moves. Use all of your senses but don’t feel like you need to be silent or sneaky. If your goal is to kill a specific vocal bull (usually a mature animal), ambushing tactics are likely the best option. You may only get one chance per season at this class of bull. Make that opportunity count. I never would have thought that ambushing elk would excite me as a hunter, but it has become nearly as enjoyable as calling them in. It has also led to more encounters with mature herd bulls. There is so much learning we can do as hunters during the long off-season. Be a student of great hunters and you will eventually become one. Tip #3: Master how to use a reed. Your inability to use a reed is preventing you from killing elk. Not only will using a reed to call in elk give you ten-fold the opportunities down the road, but having a reed in your mouth and the ability to immediately stop an elk while at full draw, will provide you at least one more shot opportunity per year. Up until 2009 I had zero ability to use a reed and my excuse was that it wasn’t necessary to being successfully or that it was uncomfortable to have in my mouth. Looking back, this could not have been more ridiculous. I can think of a handful of elk before 2010 that I easily would have killed if I could have just gotten them to stop. Not to mention, the hundreds of vocal bulls I was unable to communicate with over the years. Using my voice to stop elk flat out did not work consistently, as I tried all sorts of sounds. It may take you months of practicing every single day to finally get it, but stick with it. YouTube is your friend in this regard. Another way to practice is to record your sounds and listen to yourself, compare that to real elk recordings or great callers. Seek out experienced callers and ask for advice and stop making excuses. Here is my best example of what calling can accomplish: In 2014 I drew a special permit in my home state of Washington. In the 13 days of hunting the rut my partners and I were able to call over twenty 6-point bulls into bow range. This doesn’t account for the numerous smaller bulls we called in. The vast majority of these experiences would never have happened without calling. On the second to last day, my partner called in an 8x7 bull that I took, at 40 yards. Tip #4: Become a better archer and quit making fun of great archers for their inability to kill animals. The better you are, the less elk you will miss or wound going forward. I get it, how are they ever going to kill an elk if they take minutes to dial in their single pin sights and execute their shot routine? We have all seen it, ‘hunters’ that use their target rigs at 3D shoots and take half a century to release an arrow. But understand one important distinction, this is not an excuse to becoming a better/more disciplined archer. If you continue down this path, there will be lots of failure until you finally realize that the off-season is your opportunity to prepare yourself for the hunting season. The number of arrows fired is only a small part, it’s about making each shot perfect. YouTube and maybe a few lessons will provide you with everything you need. If you are intimated by a live lesson with an archery pro, don’t be. There is no easier way to learn and improve upon your greatest weakness, since that trait will be abundantly clear to a professional. For me, the one archery lesson I took cost me only $50 for a one-hour session, and it taught me that I was holding the bow incorrectly. My grip placement was totally wrong and the fix was easy and impactful. It was not until 2016 that I finally accepted that I had a problem with target panic, especially when drawn back on animals. I came to the realization that I either needed to quit archery and bowhunting, or use the off-season to fix my mental state. I don’t want to admit the number of animals I missed during that season, but it was a miracle I was able to fill all of my tags. Much of this problem was a complete lack of archery training in my life. Even though I started shooting at around 12 years old and began practicing regularly my senior year in high school. That does not mean I was practicing correctly. I have found that archery is 2/3 mental ability and 1/3 physical. My brain (similar to most male brains—according to my wife) is incapable of doing two things at once without developing bad habits (I.E. pulling the trigger while aiming). Target panic comes in many forms. Holding to the right, left or low, hammering the trigger as soon as the pin hits the spot, not being able to let down, etc. After over 20-plus years of shooting a bow, my target panic became so bad in high pressure situations that I could not hold the pin on the animal. I was embarrassed to even admit my problem to my hunting partner. Up until that point I had read every book I could find, watched every video and tried every technique that claimed to cure target panic. All they did was calm it down for a short period, but it ALWAYS came back, especially when trying to aim at a live animal. During the 2017 off-season, I found John Dudley’s material on You-Tube and bought my first Carter back-tension handheld release. After thousands of arrows and constantly watching the Nock On Archery Videos, I felt like I was cured. More importantly I LOVED SHOOTING ARCHERY AGAIN. I could shoot both a handheld back-tension release and my Carter index finger release with true back-tension and achieve a surprise activation with the same point of impact. I got to the point where a ‘miss’ was only a tiny bit off my point of aim, and not a single shot gave me anxiety. Explaining what back-tension means may be difficult for the average bowhunter to understand, but to give you a general idea: it’s when you get to the point where your release hand, with the help of your back muscles, are pulling directly back and you are 100% focused on your point of impact. Imagine your release hand elbow pointing exactly away from your target on a parallel line. Once your brain has been trained over the course of thousands of shots, the pulling portion becomes second nature and not something that occupies your mind. It simply happens on its own, kind of like how a baseball is released from the hand while throwing. So, when the bow goes off and you are fully focused on your aiming point, that’s where you get that slight amount of surprise due to not being able to predict the exact moment the shot will break. This technique results in vastly improved accuracy and consistency. The 2017 season was a success and I filled most of my tags, but in the heat of the moment I still wasn’t making ‘perfect’ shots. I would command the shot versus puling through them, even if holding the pin was no longer an issue. After grinding through one more off-season and exceeding the 10,000-shot count, it became automatic, even in high-stress situations. In 2018 I was able to kill 2 bull elk and 2 bears with my bow in the month of September. Not one of those shots in 2018 did I have an ounce of panic. And guess what? I pulled through for once! Tip #5: Settle the heck down in the heat of the moment. It’s just an elk. Some hunters have this dilemma and others do not. I am one of those guys that has a tendency to ‘black out’ when I have a close encounter with a bull. To most of us this is known as ‘buck fever.’ Basically, what happens is that I lose control of my emotions which causes me to get over-excited and rush my shot. I always remember drawing my bow, putting my pin somewhere ‘close’ and the next thing the arrow is on its way. This all happens way too fast even when I have all sorts of time to make the shot. We work so hard for that one opportunity and being too excited to make a good shot is something that can be overcome. One way is to create a mantra and talk to yourself in the heat of the moment. If you are talking to yourself you are in control of your emotions/actions, if you can only act, things will normally end badly. My mantra is simple, “Take deep breaths. This is just an elk and you will not mess this up. Take deep breaths. This is just an elk and you will not mess this up.” I try and say this over and over to myself as the situation unfolds. In cases where I can use my rangefinder to pre-range targets, this also helps to keep my mind focused and on task. If you are someone that gets overly excited in the moment of truth, work on this whenever you can. I like to practice when there is a cow or small bull that I don’t intend on killing. The more you do it, the easier it becomes. Tip #6: Find a soulmate that supports and understands your passion to hunt. This one is self-explanatory. It’s not conducive to success when your other half is dragging you down mentally or does not have the ability to encourage your passion to hunt. Your soulmate should be your advocate and someone who motivates you. This applies not only to hunting, but life in general. I feel very lucky to have found my soulmate. We were able to communicate about my love for hunting and the outdoors from the very beginning of the relationship. She was very receptive, and in many cases we even hunt together. It also helped that she came from a background where hunting and backpacking was very much a family lifestyle. The time we spend hunting and backpacking makes us stronger as a couple. Finding someone that appreciates the outdoor lifestyle or is open to giving it a try can be a huge win. But I cannot over-empathize the importance of being completely transparent from the beginning of the relationship about how much time and dedication goes into hunting. Soft selling or down playing how long you will be gone or how much time you spend preparing can only end in frustration and resentment from your partner when reality sets in. Tip #7: Keep covering ground until you find elk. I can’t really say this has ever been a problem of mine, but it would have been good to hear we were at least doing something right as young men. There is nothing worse than a hunter that hunts a specific area and not the elk. What that means is simple: in September you go until you either see elk, hear them bugling, or get a response. Hunting is a marathon if you want to fill tags. If you aren’t getting into elk every day, cover new ground and push further until you find them. Rutting elk love to live in small pockets where they have been pushed by hunting pressure. Often there will be 2-10 bulls in a single drainage, and nothing compares to finding these places. Tip #8: Buy once and ‘cry’ once. Quit wasting your money on subpar gear. Buy the best gear you can afford and stop replacing big ticket items every few years with something only marginally better. In the end you will save money and have a better experience. My hunting partner and I love to minimize the number of trips out with meat. Since my early 20s, I have pushed myself to train with a pack on a daily basis for months prior to the season. This is in addition to going to the gym and playing hockey. Nothing is quite like strapping on a heavy pack when your body isn’t used to it, and it doesn’t matter if you are in tip-top shape or not. This will better prepare you for backpacking in general and packing out animals. If you can find a local hill or mountain, stadium, or a stair-stepper, you can attempt to replicate the elevation gain found in the mountains. Fast-forward to 2011: after packing out two bulls, in two trips, over two days, 9 miles from the trailhead in Montana (a rare double up), my partner and I quickly saw the benefit of a good pack. It’s not that our Eberlestock Blue Widow’s failed us, it just became apparent that they weren’t ideal for 100-130-pound loads (not to mention backpacking in general). Before them, the Cabelas Outfitter frame and bag worked okay but also fell short of what was desired. I was lucky enough to be talked into a Kifaru pack in October of that same year by Aron Snyder. It was an incredible amount of money at the time, but he told me if it didn’t do what he claimed, they would take it back for a full refund. To me these are the kind of claims a person should look for in a gear company. Having a 6-pound complete pack that is capable of 200-pound loads (yes I stupidly carried that much ONCE), but is also an ideal daypack, was a game changing experience for us. It allowed us to go anywhere and have zero concern for getting the animal to the truck. The progression with shelters has also been a long and eye-opening process. After starting with a single-man Black Diamond Bibler bivy and progressing through at least six or seven other shelters, I have come to the realization that there is no easier area to piss away money. In the end I have two giant and incredibly capable shelters that have the ability to hold two men, all of our gear, and room to spare. Both of these come in at roughly the same weight as that Black Diamond coffin. Tip #9: Ignore the GIF and learn from the non-hunting UL backpacking crowd. Simple stuff here. We all start out carrying WAY too much gear and learning that the Good Idea Fairy (GIF) is out to break our will if we let her. There are dozens of things that can be added to a pack to make your life ‘easier’ in the backcountry. The majority of them aren’t necessary, nor will they be used. Playing the ‘what if’ game is a slippery slope best curbed by learning from those with actual experience. I don’t mean they wrote a blog after backpacking for 10 nights per year, I mean they have spent hundreds of nights living off their backs. In the beginning, 10 days’ worth of gear for a September elk hunt came in at 60 pounds without my bow. Now I have that down to 43.5 pounds without water while being far more comfortable and prepared. 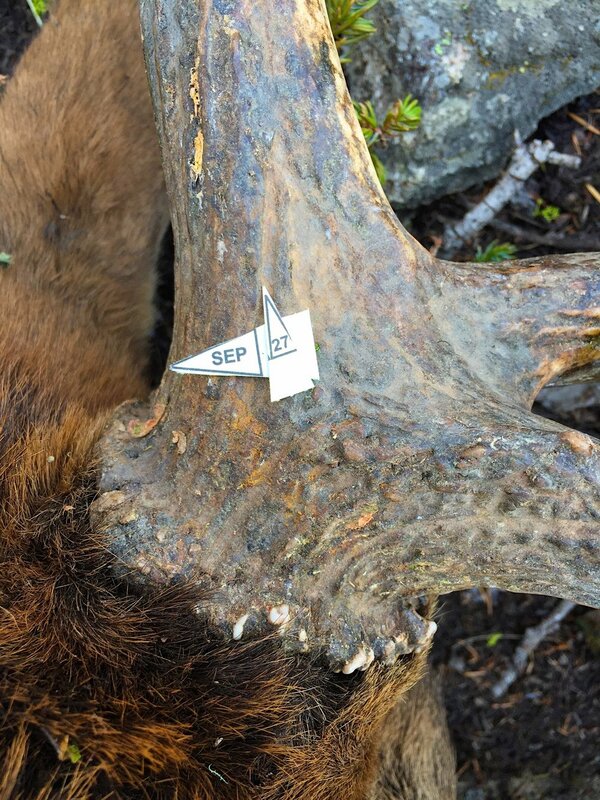 The amount of information available on the forums can be overwhelming at first, and obviously an UL backpacker doesn’t have everything you will need on a backcountry elk hunt. But they provide an excellent starting point for the ‘big-ticket’ items. Pack weight is driven by a few major areas: food, sleep system, clothing, pack weight, and maybe optics depending on what you are doing. Buy a scale or two, create a spreadsheet after researching others online, and come up with an idea for pack weight in advance of a hunt. Life in the backcountry is a continual learning process, but will begin to get easier. Tip #10: Hunt for the right reasons and don’t be motivated by ego. Don’t forget, trophy hunting is a trap that leads primarily to disappointment. It’s unlikely I would have listened to this advice but hearing it could have shortened this ‘phase’ for me. When you are driven by your motivation not to fail in the eyes of others, you are not only guaranteeing some failure, you are cheapening the reason you hunt. When you hunt to not let yourself down, you find the true meaning of what has driven humans to be hunters. The level of self-accomplishment when an animal hits the dirt, and you place your hands on it, is hard for non-hunters to grasp. A good way to know if you are being motivated by ego is to ask yourself if you regret passing a legal animal after the season. Would you have been happy with that spike or raghorn? If the answer is yes and you still passed the bull, it’s time to do some soul searching. Kill what makes you happy and raise your standards when YOU feel that it’s time to raise them. The success of your hunt should not be motivated by outside forces, such as social media or hunting forums. If you are perfectly fine not filling your tag on a younger animal, I envy your resolve. Eating elk and deer is currently more important to me than the size of the antlers. But that is not to say it should be the same for you. You must do you. Writing this has made me realize that there is no finish line in archery elk hunting. Much like our experience in competitive sports, there are ups and downs. There are, of course, goals for what you are pushing yourself to achieve, but we are all looking for greater consistency. Perfection can never be achieved in hunting because so much is outside of our control, but as we get better, smarter, and more seasoned, there becomes more highs and less lows. Looking back on the many highs over the course of my hunting career only fuels me to push harder and become better. The quest to be out there chasing elk with my bow is insatiable. Learn from my lessons but never stop being a student. Someday looking back from the perspective of my 50-year-old self, it will be interesting to see how the priorities and suggestions change with time. I truly look forward to that day (other than the getting old part). By then, I will surely have slowed down some and found ways to work smarter and not harder. Will my top 10 remain the same? Who knows? All I know is that by then, I’ll be able to fill a few books with my experiences and that will likely be the perfect time to settle down and write for real during the off season. Thanks for reading guys! Hunting season is just around the corner—don’t forget to head on over to the pre order page and pick up a copy of Team Bad Decision!